If you think spending at least a little part of your day sniffing around Google, taking a quick peek at relevant Facebook pages or updating your LinkedIn profile represents slacking, then you might be a good candidate for learning more about inbound marketing – today’s way to identify a target audience and speak directly to them. 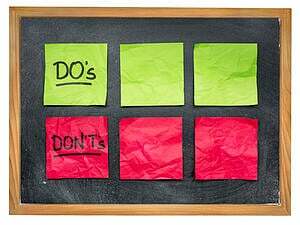 Your web marketing partner can give you all the details, but here’s a “do/don’t” list for the inbound first-timer. DO Start Now - If all your marketing efforts are based on yesterday’s “outbound” tactics – we’re talking about fading media like radio/TV, direct mail, cold calls, Yellow Pages and even those pop-up ads on computers – then you’re no longer reaching new B2B clients where they live: online; and particularly on Google. Skeptical? Do a Google search of your two main competitors and see what pops up. If something tied to their business is at the top of your Google results page and your content is buried at the bottom (or, worse, after page 1), then you have some catching-up to do. DON’T Assume - People often assume their customers will always be content with what came before. Certainly if you know of a customer who decidedly dislikes everything about the Internet, you can continue contacting him the way he feels comfortable. But 90 percent of today’s consumers – B2C and B2B alike – start their search on Google. But only about 21 percent of marketing companies are actively involved in inbound or content marketing. DO Involve Your Entire Staff - After all, their expertise and customer insight can be a valuable source for the content you’re going to provide to your customers and prospects. Throw a casual pizza lunch for your employees and brainstorm the kinds of topics you can cover, and who can provide the relevant information. If your staff members are good writers or videographers, they may want to take on the actual project; otherwise, let them know that you’ll be working with a reputable web marketing company to give every piece of content a high polish so that it is more attractive to web surfers and to Google. DO Engage, Educate and Entertain - Do Write and publish your content to engage, educate and entertain customers and prospects. Especially in a rapidly evolving industry like manufacturing, the chance to amaze people by giving them food for thought (not a sales pitch) can establish your company as credible and expert-driven. Use your blogs, articles, eBooks and whitepapers to examine your industry, uncover trends and give useful timesaving or money-saving advice. The best content gets shared via social media, further getting your name out there. DON’T Disguise Your Content as an Ad - Inbound marketing works in a series of stages, and the content-creating and publishing stage is not the one to ask for business. Today’s web surfers are a savvy group, and they can tell when they’re being schmoozed and will respond appropriately (i.e., a quick escape). You need to make yourself identifiable out of the countless other manufacturing blogs and videos out there, and you have to let visitors know it’s ok to contact you further. A well-designed landing page helps turn casual visitors into qualified leads – and once they’re at the “lead” level, you can begin reaching out to these prospects individually. There are plenty more dos and don’ts tied to manufacturing marketing, and pretty much all of them have to do with the tenets of inbound marketing: Get yourself found, use outstanding content to attract attention, employ strategic SEO words to catch Google’s eyes, create strong landing pages that tempt visitors into becoming leads, follow-up strategically on those leads and ... so very vital ... test and test again your response rate, so you can fix any glitches in the inbound funnel.